Please make sure that your Mac is not configured to automatically install operating system (OS) updates. Since Apple recently released a major update to the Mac operating system, now is a good time to make sure your Mac doesn’t automatically install this update. The reason why I advocate this position is that major updates often introduce significant changes to how things look and operate. Additionally, some of your applications or peripherals may not be fully compatible with the new operating system. Most people do not want to unexpectedly have to learn a new way of doing things or deal with the inconvenience of a critical application not working properly. In previous Tech Tips I write about when one should install major updates and how to do it. I do not feel that everybody needs to install every major update to the Mac operating system. If you do choose to install every major update, I don’t recommend doing it until a couple of months, or more, after it’s released. Instead, I think it is often sufficient to install every other or possibly every third major update. For these reasons, I encourage you to make sure your Mac is not configured to automatically install OS X updates. Here’s what you need to do. Click on the App Store icon. Uncheck, if needed, the box labeled Install OS X Updates, as shown in the image below. This image was taken on a Mac running OS X El Capitan (aka OS X 10.11). 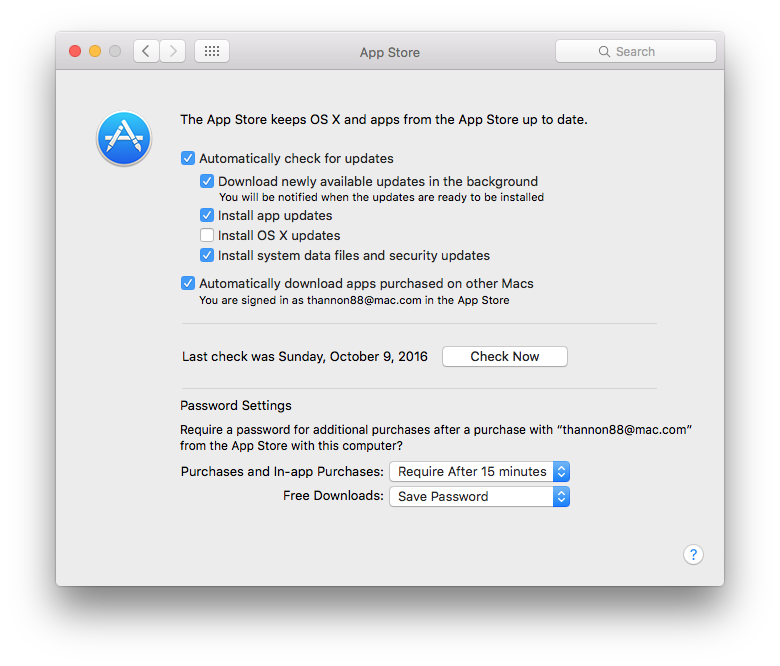 Please be aware that the options listed in the App Store’s system preferences might vary slightly on different versions of OS X. Read more about App Store, disable automatic updates, OS X upgrades.